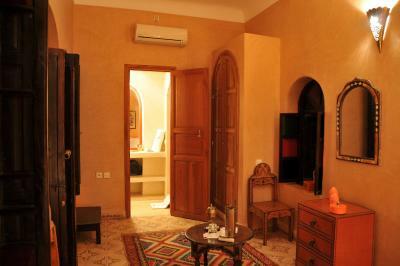 Lock in a great price for Riad Adriana – rated 9.4 by recent guests! The staff was friendly and helpful. 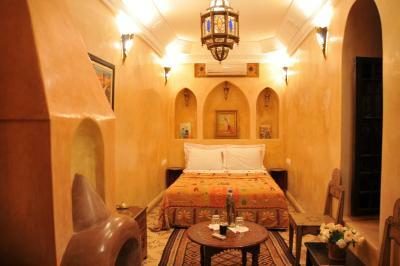 Would stay at Riad Adriana again. Breakfast was great, a traditional Moroccan spread served on the terrace. It included breads, crepes, pancakes, fruit, yogurt, fresh juice, coffee/tea, various jams and butter/honey. The terrace is a lovely place to eat as well. We spent a lot of our time up there. This place is beautiful. 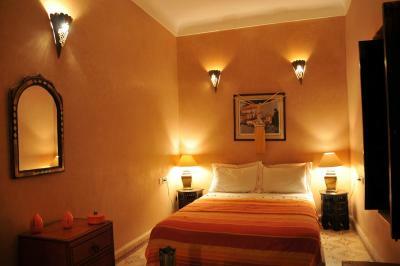 Rooms are decorated very nice and breakfast on the terrace is just perfect. We have been welcomed with the hot tea and biscuits. I would definitely recommend this place. Thank you very much Riad Adriana. 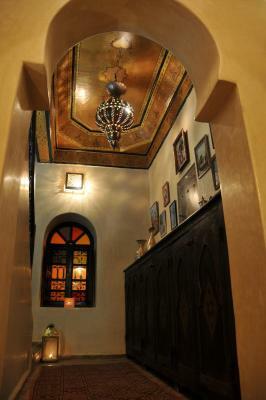 Beautiful Riad reminds you what it was like to live in morroco long ago. Property was amazing and super well maintained and staff was very attentive and helpful to our needs. Riad owner and manager , Melanie was great. Very helpful for whatever you needed. Place was close to the souls by walking and super easy to get to all the prime spots with 20 min max. Melanie and all the staff are very friendly and helpful. It was my first time in Marrakech, traveling alone, and Melanie gave me lots of good advice and helped me arrange transport to my next destination. Plus the venue is charming and quiet. Breakfast on the rooftop terrace was a fabulous start to the day. Loved everything about my stay! the staff, the beautiful and comfortable room, the delicious lamb. Everything about the property is excellent. It’s excel my expectations. Highly recommended!!! Lovely room, traditional decor, breakfast was great, dinner was fantastic, staff was good and very helpful is planning dining, excursions etc. 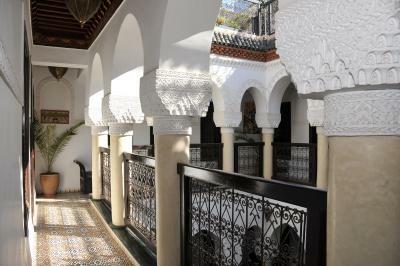 One of our top picks in Marrakesh.The riad enjoys an exclusive location in the Medina of Marrakesh, in the privileged district of Bab Doukkala, just minutes from the famous Jamaâ El Fna Square and of the souks. 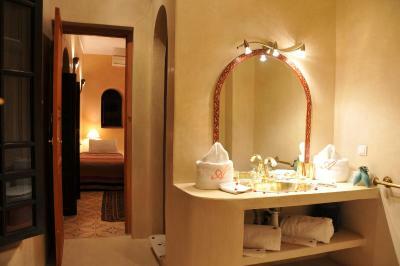 All the rooms and suites of Riad Adriana are decorated in natural colors which offer an atmosphere of peace and serenity. They are equipped with air-conditioning and some have fireplaces. 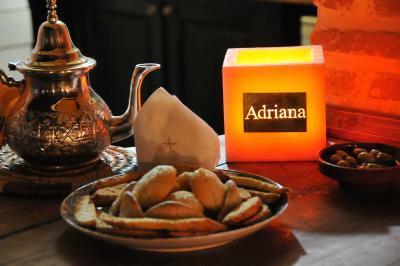 Riad Adriana has a catering service available under prior request, which specializes in Moroccan cuisine. It offers a free Wi-Fi access. 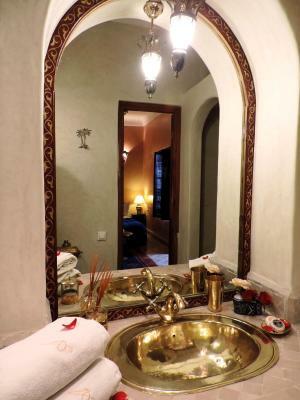 Riad Adriana has a partnership with a wellbeing center that does massages and is equipped with a hammam and a spa. 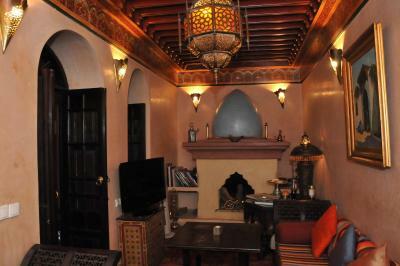 뀐 Located in the real heart of Marrakesh, this property has an excellent location score of 8.9! 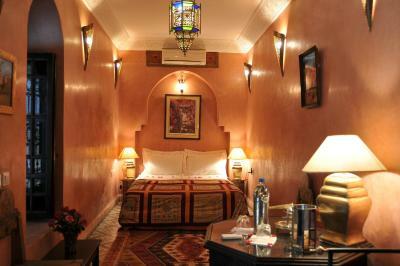 When would you like to stay at Riad Adriana? 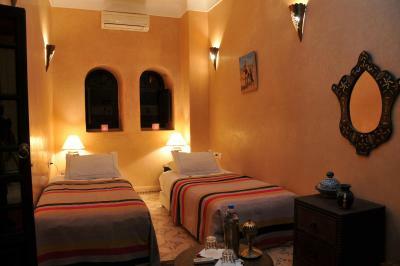 The rooms are decorated in natural shades and feature air conditioning. 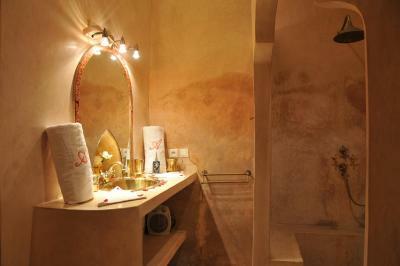 The rooms are air-conditioned and feature a private bathroom with a shower. 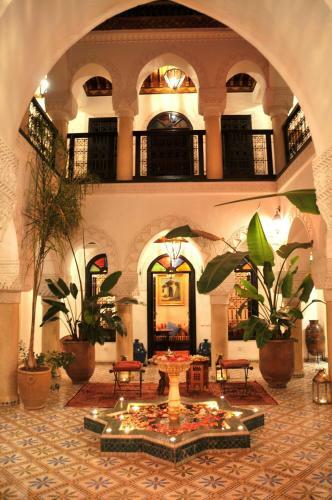 House Rules Riad Adriana takes special requests – add in the next step! 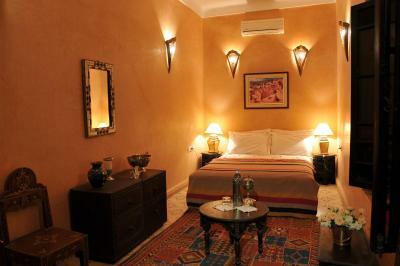 Riad Adriana accepts these cards and reserves the right to temporarily hold an amount prior to arrival. Extra beds and cribs are only available upon request and availability. Please inform Riad Adriana of your expected arrival time in advance. You can use the Special Requests box when booking, or contact the property directly using the contact details in your confirmation. The homemade yoghurt was great! Everything was to the point! 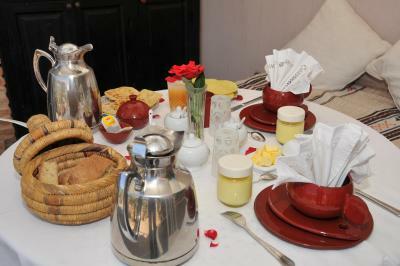 Convenient location, beautiful deco, luscious breakfast and the most important - GREAT STAFF. A place to return and to recommend. I did not find this a problem but some people might - to get to the Riad Adriana you are dropped at the Bab Doukkala ( gate in medina walls) you then have to walk 200 yards through a general market with its accompanying aromas- lots of butchers and fish stalls - you need to look ahead! And down a very small alley . There is no road access to the Riad so for taxis you have to walk back to the gate. 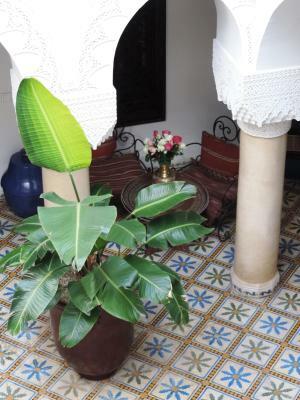 If you have mobility problems it may not be the Riad for you . 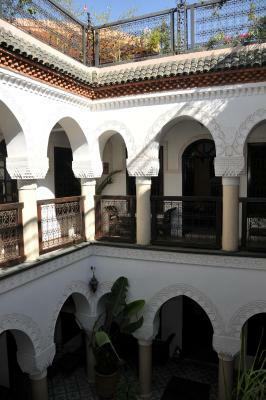 Lots of Riads in Medina are the same . Huge breakfast on roof terrace - can’t comment on coffee as don’t drink it . Everything is beautifully decorated and put together . Melanie the owner is French but speaks fluent English. She is extremely helpful with maps and places to visit - some of them not so well known . 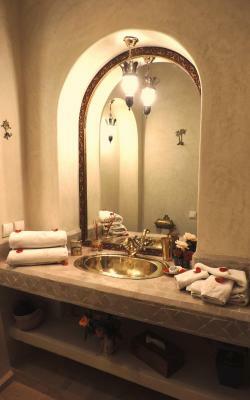 Very nice bathroom with brass fittings including the basin. High quality bed linen & towels . It’s really good value for money , I would stay here again and thoroughly recommend . Lots of stairs ! Very caring staff. Nice roon. Amazing breakfast. Good location. Melanie, the hotel manager, was very helpful. We got the Bordeaux room, but located on the groundfloor and with holes in the windows, we had no pricacy at all; one window was for the bathroom, and could actually hear when someone was on the toilet, the other ones on the sleep room. Some people were having drinks in the evening near our room, and we could hear all their conversation being in our room. I would suggest to take earplugs to sleep! Lastly, I must say the Wifi was terrible - no connection most of the time. 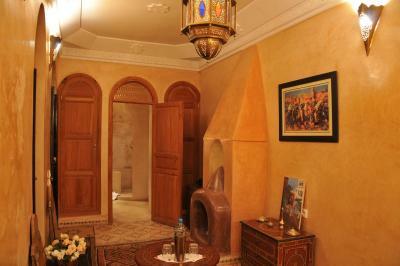 Located in the Medina, right next to Bab Doukala. 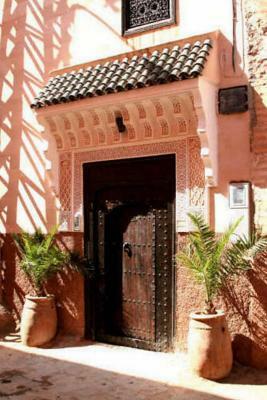 Easy access to the Medina but also to the new city Gueliz, approx 15min. 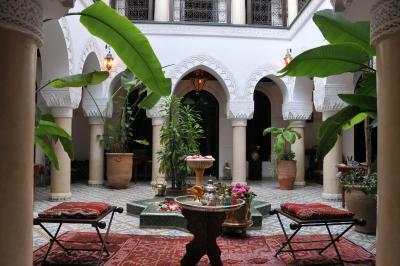 We only stayed 2 nights there, after our desert trip, and we saw most of the Medina before so we didn't access the Medina via this Riad. 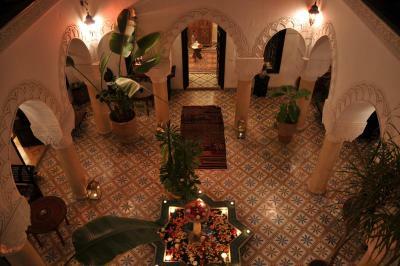 Staff were very friendly and nice, and the Riad itself was cosy and beautiful. Breakfast was available on the terrasse, and tasty. Just noticed that breakfast was different on 2 mornings; first morning we got strawberries, yogourt (I think it was home-made, very tasty! ), pancakes and bread. The second morning, we got yogourt and pancakes. We were waiting for the bread to come, but never came to us - as we were also in a hurry to go to the airport, we didn't ask for it. 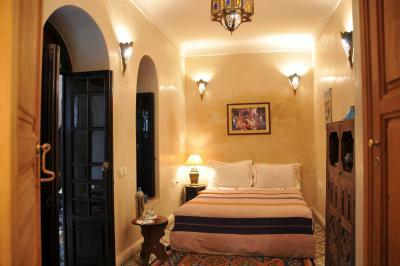 Riad Adriana is a gem! 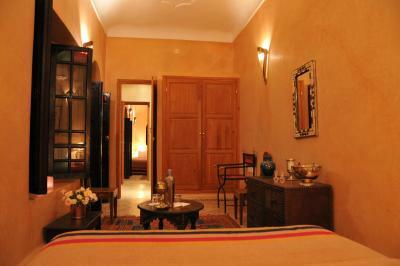 The riad is located within walking distance of all main tourist attractions in Marrakech. 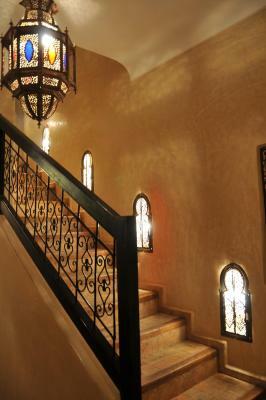 The riad is a beautiful place of peace and tranquility. 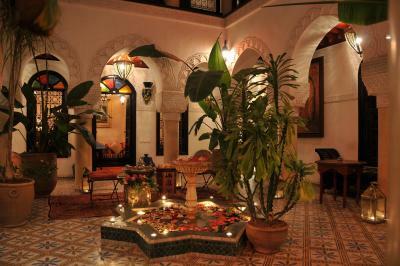 When we entered we noticed the lovely smell of roses that surrounds the whole riad. Our bed was decorated with rose petals and we received a small bowl of traditional Moroccan cookies and a bottle of water. We were welcomed on the beautiful rooftop terrace by Melanie. We were served traditional Moroccan mint tea and cookies and she gave us a map and marked all tourist attractions as well as restaurants she recommended. 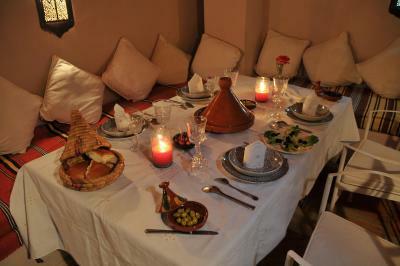 We had dinner the first night at the riad and it was delicious! The breakfast is big: yoghurt, coffee, tea, orange juice, Moroccan bread, a variety of jams, fruit, an omelette and pastries were served every day. All staff members were friendly and helpful. 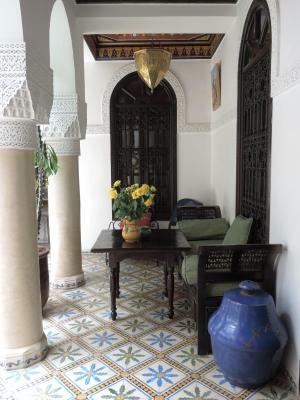 The building itself is beautiful - we would definitely recommend Riad Adriana. 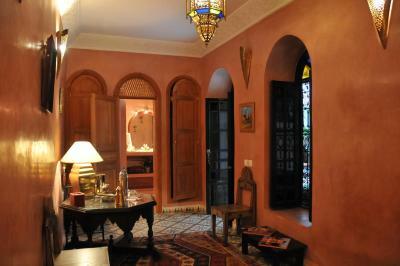 Riad Adriana is situated in a little quiet street inside the Medina. 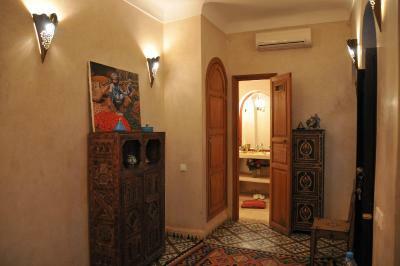 The place itself was beautifully decorated, very clean and quiet and the hosts were very welcoming. The breakfast, served in the rooftop, was delicious and with many available choices. 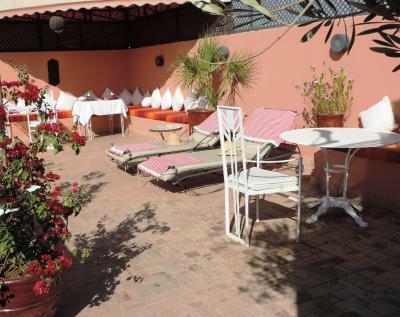 The Riad is a few walking minutes to the Souk and within walking distance to pretty much all of the central attractions in Marrakech. Breakfast coffee could have been hotter. Room cleaning staff had OCD with respect to tidying our belongings. Very welcoming! Comfortable and relaxed atmosphere. Right in the heart of the city but still quiet. Extremely helpful owner and staff. The only thing which confused me was breakfast. We stayed 3 days and each time breakfast contains different number of dishes (first day we were offered an omelette, wurst, tea, plus to all the rest, the other days we were not. Is there any standard for breakfast?). Besides ladies at breakfast seemed not very friendly so we felt sorry to disturb them with all our requests. 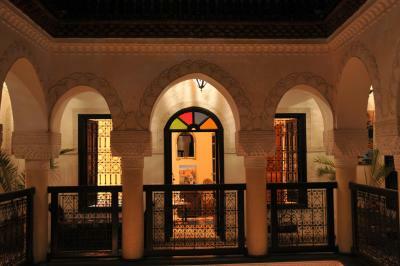 Our stay at the Riad was absolutely amazing, the room was big and spacious, the staff were very friendly and it’s in a great location. The highlight was the breakfast though, it’s phenomenal, for no additional charge I was thoroughly impressed. 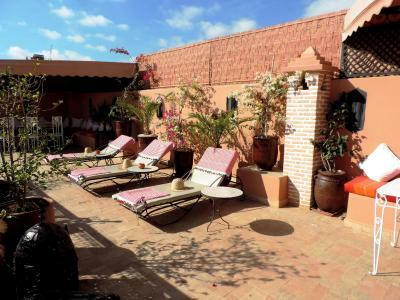 Would highly recommend this Riad, it’s amazing value for money. I struggle to find something to write here.